Students practice spelling words in groups with similar word patterns, using the Words Their Way program. Students are encouraged to properly form lower case and capital manuscript letters in their writing. During the second half of the year, they learn the lower case and capital cursive letters. The eight parts of speech are taught in isolation and then applied to sentence writing. Once all eight parts have been taught and discussed, students identify them within sentences. Grammar skills, including punctuation, capitalization, compound words, antonyms, synonyms, homonyms, and contractions are practiced. Second graders work on writing different kinds of sentences (declarative, interrogative, exclamatory, and imperative) in daily writing assignments and journal entries. Daily Writing Workshop also gives students an opportunity to learn and apply writing skills to personal narratives, poetry, and fictional stories. Students practice using the dictionary and thesaurus and prepare their first book reports. By participating in a daily Reading Workshop they learn and model comprehension skills. Students then practice the skills as they read books independently. Students are encouraged to read a variety of genres and choose books at their appropriate levels. In addition, students read and discuss books as a whole group. 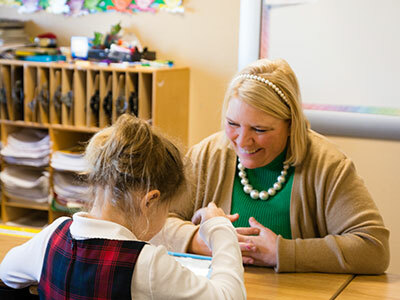 In the Singapore Math program, basic concepts introduced in first grade extend to reading and writing numbers through 100s both in digits and in words, adding and subtracting to 1,000 without renaming, and completing those operations with renaming. Topics covered this year include standard and metric measurement, multiplication and division through 5s, money, time, geometric shapes, graphing, and area of simple figures, with extensive practice with word problems. Students in second grade continue to nurture a sense of wonder and curiosity about the world while developing a more concrete sense of the process of experimentation. They learn to hypothesize, observe and study the results of their experiments while utilizing the campus environment to study structural adaptations of plants and animals in a variety of ecosystems. Second graders compare and contrast the moon and the earth, looking at size, rotation and revolution differences. World History includes the study of India, China, and ancient Greece. Studying the creation of the U.S. Constitution, westward expansion, civil rights, immigration and citizenship helps students build their background knowledge and make connections with history through discussion, the sharing of related picture books, projects, mapping, and writing assignments. Students explore each culture through many lenses: people and places, interactions, culture, social structures, and change and continuity. Second grade continues to build vocabulary and begins to study sentence construction. Emphasis on building vocabulary uses children’s poetry, songs, and role playing. Topics include a review of first grade material, the alphabet, numbers, the house and house furnishings, entertainment, seasons and activities, food, restaurants and table settings, likes and dislikes, school subjects, instruments, adjectives, buildings, the zoo, and prepositions. Throughout the year, students enjoy learning about the various cultures and regions of the Spanish-speaking world, including units on Cinco de Mayo, Día de los Muertos and Christmas celebrations while they develop competency in speaking, listening, reading, and writing. Second grade uses the book “Viva el Español” System B. 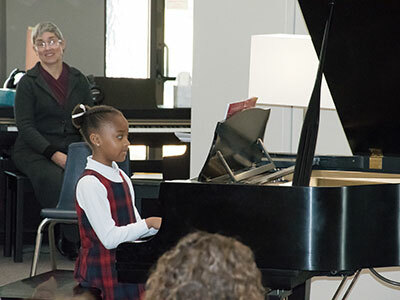 In second grade, students continue with weekly piano lessons, applying an expanded understanding of musical concepts learned in the music classroom, such as greater attention to articulation, dynamics and form as well as rhythm and pitch. This year they also perform in both a fall and a spring piano recital. 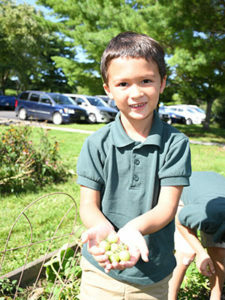 Classroom activities include singing, movement exploration including circle dances, playing instruments, and music games. Reading and writing musical notation expands to include a wider range of notes, rhythms, additional symbols, and vocabulary. This year, students learn to identify instruments in each of the four orchestra instrument families and are introduced to more excerpts of orchestral music and some of the composers who wrote them. Students review color, line and shape while they study sculpture and architecture for symmetry and balance. They also study depth, perspective, light and shadow in two-dimensional artworks. They also look at children’s book illustrations and create works in the style of an illustrator. Making clay sculptures and examining topics and activities to complement other class subjects, such as Greek mythology, may be added. The program emphasizes physical skills that can be applied in multiple sports situations. Through games and drills, students learn basic skill development, fine and gross motor movements, spatial awareness and basic strategy. Students develop confidence and motivation to participate in organized and individual physical activities. Learning leadership, teamwork and good sportsmanship also emphasizes lifelong fitness.